February Calendar and Morning Meeting: This Valentine-themed lesson pack will take you and your students through the month of February. Students can practice skills using the calendars, morning meeting activities, attendance chart, graphing and math activities, and more. Valentine’s Day Gallery Pack: Feel the love all month long with this fun pack, which includes plenty of opportunities to practice skills along with a variety of activities, templates, and clipart. Lesson Renovation | Black History Month: Celebrate Black History Month throughout February with these lessons, which include important African American men and women who have made an impact on our country's government, laws, and rights. 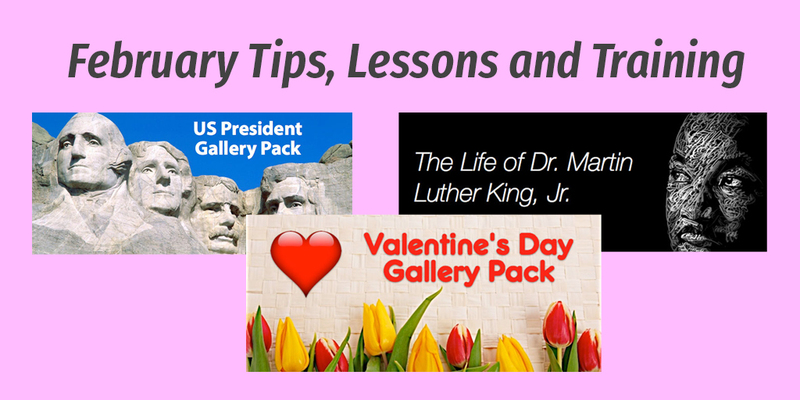 Presidents of the United States Pack: This pack contains images of all of the presidents of the United States, backgrounds, templates, and lessons/activities ready to use in your classroom as you celebrate Presidents’ Day. Happy Birthday, Abraham Lincoln: Ideal for students in grades 1–4, this lesson celebrates the life of Abraham Lincoln, the 16th president of the United States, with a video introduction, true/false and cause/effect questions, and a fun flash review. Lesson Renovation | Read Across America With The Lorax: In celebration of Dr. Seuss' birthday, this follow-up reading comprehension lesson pairs with the author's famous book. Be sure to read the book with your students first! These handy tips will make you a pro in no time! As teachers, we look for ways to save time and make planning for classroom activities efficient. MimioStudio™ classroom software comes to the rescue with the MimioStudio Gallery! If you find yourself using a variety of instructional components over and over, make sure you are utilizing the Gallery. It’s already loaded with all kinds of goodies, including graphics for lessons, multimedia, and templates. With just a few clicks, you can add anything you create or use in your lessons to your Gallery, making it easy to use anytime you are in the software. You can even add keywords to your own added content, allowing the ability to search through the entire Gallery for what you want, whether it was created by you or included already. One powerful feature of the Gallery is that it is fully customizable, allowing you to create your own folders of content that can be easily accessed any time you are in MimioStudio. If you find yourself doing repeated procedures as you create a lesson, turn it into a lesson template. You can drag full pages of a lesson into any area of the Gallery to create a lesson template page that can be used at any time. The Gallery serves as a great warehouse of multimedia, which includes sound clips, Flash objects, and movie clips, along with graphics that you can add yourself to access when they are needed. Plus, you can find Gallery Packs with various themes created by fellow educators on MimioConnect. Once downloaded, you can add this collection to your own Gallery, expanding the possibilities yet again. Learn more in our upcoming “Using the MimioStudio Gallery” Quick Learn session this month, offered on February 7 at 7:00pm ET and February 20 at 8:00pm ET. Need to record your lessons? We’ve got you covered! In education, we challenge ourselves to provide the best learning opportunities for our students. It’s our hope that students are not only engaged in the learning process, but also have meaningful opportunities to learn and apply concepts to other areas of their lives. Creating opportunities for those “Aha!” moments inspires us all and creates a unique experience with lasting impact. Those moments are also possible for us educators, as we can always learn new things to use in the classroom. I was recently working with one of our science teachers, who was helping create lesson plans for a long-term substitute teacher. The substitute has absolutely no science background, making it a challenge to bring the proper level of instruction to the classroom. While exploring ways to help the substitute with delivering content to students, a light bulb came on. They had remembered a forgotten nugget included in the MimioStudio software: the MimioStudio Recorder. I could see the excitement start to build as the teacher thought through the ways this tool could make it easier for them to create lessons for the other class, even though they wouldn’t be the primary teacher. Since both teachers cover the same type of course, it made perfect sense. Using the Recorder, along with the MimioView™ document camera and a microphone, she was able to record what she was doing in her class. The Recorder captured things she was presenting on her screen, along with anything she was demonstrating under the MimioView. It also captured all of the audio, making it a complete lesson package. Once the recording was captured, she was able to provide the content in MimioStudio for the substitute teacher to show in his classes. Students could watch the video lesson and learn the key concepts presented—as questions come up, the substitute teacher answers what he can, and the supporting teacher checks in to help students as needed. Students have responded positively to this flipped classroom approach and are now learning content they would likely be missing out on otherwise. The teacher has even gone a few steps further, providing the lesson recordings on her class website for the students to access, allowing a great opportunity for remediation, make-up work for absent students, and review as needed. The MimioStudio Recorder not only created an “Aha!” moment for us, it helped solve a problem during an unfortunate situation that will continue to have an impact. If you haven’t discovered the Recorder yet, it’s a must to check out! Inspire yourself and learn more in our upcoming "MimioStudio: Extending Lessons" Quick Learn session, offered on February 14 at 7:00pm ET and February 28 at 8:00pm ET.